Dry flies float on top of the water. Using dry flies can make your Smith River fly fishing trips much more exciting, because the fish have to break the surface of the water to try to bite. Most dry flies are designed to resemble “nymph” insects, which are the pre-adult stage of flying insects. Sometimes, though, fishermen will use dry flies designed to look like grasshoppers or other non-flying insects. 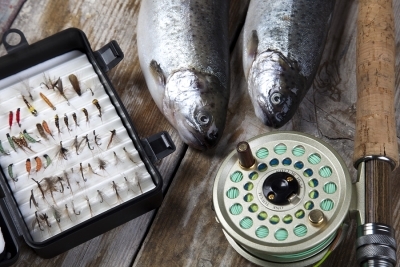 However, if you notice on your fly fishing trip that the fish seem too spooked or cautious to bite on the surface, you should use a different type of fly. Though some dry flies look like insect nymphs, the type of fly called a “nymph” fly is a special kind of sub-surface fly. As experienced guides will tell you, nymphs should “match the hatch”—that is, they should resemble local insects that would normally be hatching around the time of year that you take your fly fishing vacation. Because nymphs are designed to sink below the water, you might wish to use a floating strike indicator so you can tell when you have a bite. This type of fly resembles larger fish food, such as leeches or minnows. To use them properly, you need to know how to “strip,” which requires you to reel your fly line in with short bursts to mimic the movement of these organisms. Fish will bite streamer flies harder and faster than the other types, so be prepared for a harder strike.